City Manager Dana McDaniel is the chief administrative and law enforcement officer of the City of Dublin, responsible to City Council for the day-to-day operations for the City. Other responsibilities include advising Council regarding the financial status and future needs of the City, reporting to Council on the general operating of City departments, divisions, offices, boards, commissions, bureaus and agencies, as well as exercising leadership in the development of City projects. Dublin City Council and the City’s administration are proud of the accomplishments of 2018 and even more excited for the beginning of a new year. Both have worked hard together to prioritize the City’s future efforts in the form of a 2019 operating budget and a 2019-2023 five-year capital budget. These budgets are the result of our collective forward thinking, building on our past traditions and accomplishments, and innovating for the future. Of course, none of this happens without the input of you, our residents and businesses, and without the dedicated service our City staff. We believe these budgets will help to provide the best quality of life and environment in which our residents and businesses can thrive. Safe and resilient community: Public and employee safety remains our highest priority. The Dublin Police Department continues to provide an environment which is one of the safest in the nation. Our officers and their leadership engage pro-actively with our residents, maintain high presence throughout the community and in our schools, and offer many services to raise awareness of and prevent crime. They have done much to raise the awareness of drug addiction and fight prescription pill abuse with take-back events. We work seamlessly with the Washington Township Fire Department to respond to any emergency and we plan and train together to ensure we are prepared for man-made or natural disasters. Despite the relatively dangerous work our employees perform every day, our employees have garnered an impeccable safety record demonstrating their outstanding skills, protecting the public, and saving the City millions of dollars in workers compensation costs. The City’s five-year capital improvement program will continue to invest in your safety through road maintenance and new road enhancements, adding shared use paths, improving aged playgrounds, replacing and repairing sidewalks, and replacing, maintaining and improving our critical water and sewer systems. The Franklin County Public Health Department will continue to work with our community as our contracted public health agency to provide key services in community health, food safety, tobacco prevention, immunizations, and plumbing inspections in partnership with our own building and engineering inspection services. Smart customer-focused government: This past year our residents, through the National Citizens Survey, rated Dublin city services with an overall approval rating of 99% – one of the highest among more than 200 cities participating in this national survey. We take great pride in providing best-in-class services ranging from recreation programming, curbside services such as refuse, recycling and yard waste, snow removal and street sweeping, policing, parks maintenance, and so much more. Our City departments continue to be accredited by their professional associations and consistently achieve high honors and awards recognizing them among their peer organizations and communities as some of the best in the nation. We do this through innovation in everything we do. As staff, with the guidance of Dublin City Council, we never rest until our best is better, and our better is best. Economic vitality: People continue to enjoy doing business in Dublin. Office buildings in Dublin maintain a low vacancy rate and regionally competitive. More office space is planned to be built adding to the vibrancy of our local economy. We continue to actively engage and forward plan with a focus on retention and expansion of our existing businesses and attracting new businesses. Developing an ecosystem for new startup companies and technologies continues to be a key strategy as well. The City is at the forefront of constructing intelligent infrastructure to support the emerging industry around connected and autonomous vehicles. We continue to build upon the successes we have gained in emerging industry clusters such as technology, healthcare, automotive, and research and development. Significant public and private investments on the City’s riverfront have been coming to life this past year and will continue to become reality in 2019. Great progress has been made on the new Pedestrian and Bicycle Bridge over the Scioto River, connecting Historic Dublin with Bridge Park. The City remains focused on its Historic District to ensure it is protected and at the same time serves as an integral and contributing part of our local economy. The City successfully completed updates to two key area plans this last year – the West Innovation District and the Dublin Corporate Area Plan, a plan to set conditions for, revitalize and keep competitive its aging office parks. We are now in the implementation phases of these plans to upgrade zoning codes and we will begin to see new investment and projects in these areas. Dublin remains and will continue to be a vibrant local economy. Community engagement: We are and always have been a proud local democracy. City Council, its Boards, Commissions, and Committees, combined with both Council and staff’s resident and neighborhood engagement efforts, provide many opportunities for residents and businesses to be involved. The City’s Aging in Place initiative, West Innovation District Plan, Dublin Corporate Area Plan, and development of its Sustainability Framework are great examples of bringing our residents together to address our future. We continue to improve our methods of communication to include in meetings, leveraging all media outlets, mailings, website, and social media to better connect with you and respond to your questions and concerns. Fiscal health: The City’s fiscal health remains strong. City revenues have continued to surpass estimates. Revenue estimates have been relatively flat as office real estate assets have been repositioning themselves within the market. By anticipating this, setting budgets accordingly, and operating within Council’s fiscal policies, the City continues to operate well within its means. For example, the City retains a healthy reserve in excess of 70% and operates within the confines of the City’s debt policy, leaving significant debt capacity now and in the future should it be needed. The City has and continues to have positioned itself to execute an aggressive five-year capital budget investing in its neighborhoods, setting conditions to attract future economic investment and reinvestments while retaining the capacity to provide best-in-class services. This past year, the City of Dublin’s 2018 Operating Budget was awarded the Distinguished Budget Presentation Award by The Government Finance Officers Association (GFOA). The City also retained and achieved the highest of bond ratings. The City also received another outstanding Auditor’s report. I hope you will agree there has been much accomplished and much still to do! We look forward to connecting Dublin to you, our residents and business, so you can thrive! Dana L. McDaniel became the City of Dublin’s fifth city manager January 31, 2015. As city manager, he serves as the chief administrative and law enforcement officer and is responsible to City Council for the day-to-day operations of the City. McDaniel has been employed by the City for 30 years. He has served in various roles, including management assistant to the city manager, director of service, deputy city manager/director of economic development and director of development. McDaniel served with the City of Dublin during a time of rapid growth and expansion. As the City’s first director of service, he led the establishment of a service department that was one of only nine in North America to be accredited by the American Public Works Association. McDaniel was instrumental in the development of Dublink, Dublin’s state-of-the-art broadband fiber-optic network. He is co-founder of the Central Ohio Research Network and helped create the Dublin Entrepreneurial Center, which currently houses more than 100 start-up companies. McDaniel oversaw the expansion of economic development programming resulting in the attraction, retention, and expansion of more than 14,000 jobs. Under his leadership, the City was twice named one of the Top 7 smart cities in the world by the New York-based Intelligent Community Forum and has received numerous awards from the International Economic Development Council, the Ohio Economic Development Association, and the Mid-America Economic Development Association. In 2018, McDaniel was recognized as by the Asian-American Commerce Group as the Government Leader of the Year for his efforts in increasing the visibility of Asian-Americans. McDaniel also received the 2018 C-Suite award from Columbus Business First as one of the most admired executives in Columbus in the category of institutions. This award acknowledged McDaniel among the region’s most-accomplished business leaders, inspiring and encouraging others in the community with his integrity and excellence. In 2016, he was recognized by the Ohio State University Alumni Association for Outstanding Public Service. Five years earlier, he was awarded the Outstanding Alumnus Award from The Ohio State University John Glenn School of Public Affairs. In 2013, McDaniel was honored with a lifetime achievement award by the Intelligent Community Forum. The Dublin Chamber of Commerce recognized him with its President’s Award for his dedication to the Dublin Chamber and its business community. McDaniel earned his bachelor’s degree in public administration from Miami University of Ohio and his master’s in public administration from The Ohio State University John Glenn College of Public Affairs. McDaniel also received a master’s degree in strategic studies from the United States Army War College. McDaniel has continued to serve on several regional and local boards, including the Mid-Ohio Regional Planning Commission (MORPC) Transportation and Policy Committee, Development Advisory Committee of the Muskingum Watershed Conservancy District, Franklin County Emergency Management & Homeland Security Agency, Dublin Chamber of Commerce, and Miami University’s Public Leaders Advisory Board. 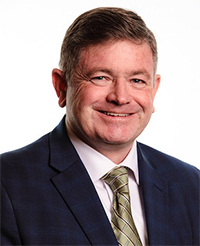 He is an ex-officio member of the Dublin Methodist Hospital Foundation Board and was recently appointed chair of MORPC’s Smart Region Task Force. He retired from the Ohio National Guard following a 35-year distinguished career. McDaniel enlisted as a Private/E1, rising to the rank of Brigadier General. McDaniel served in numerous command and staff positions from platoon to division levels. He is an Iraq war veteran. He and his wife Lisa Patt-McDaniel are Dublin residents and the parents of two daughters, Caitlyn and Colleen.